LGBT+ representation in media is important, so this Pride Month pick up a book and go on an adventure in which you see yourself reflected within its pages. Our “To Be Read” piles may be towering over us, but that doesn’t mean we can’t shift aside some books to make way for others. When I find out a YA book is LGBT+, I move it up my TBR list because, while fantastical, they have a more realistic feeling because of representation. I’ve compiled a list of the best LGBT+ YA fantasy books, that would make great additions to your June book lists. Some are series, some are standalone books, but all have at least one LGBT+ character or couple. Recently, a trend in YA fantasy that has queer and gender diverse elements in it that I can get behind is that the plotlines aren’t solely about the characters’ sexuality or coming out. Most of the time, it’s interwoven within an already full storyline and plot progression. Sure, some have coming out stories within them, which are important to represent, but most within the fantasy genre have different sexualities and genders interweaved within a story so easily that it would be difficult to see it written another way. Every Heart is a Doorway is the first book in the Wayward Children series in which children find doorways that take them to other worlds where they feel like they belong. Within WC there are multiple types of representation that is presented at face value without judgement, which is refreshing. Wayward Children has asexuality, lesbian, and transgender representation with themes of acceptance and belonging throughout. Not only is Peter Darling a must read for any Peter Pan fan, but this retelling has a wonderfully done fresh take on the lore surrounding Neverland itself. Not to mention the LGBT+ aspect with transgender and gay representation. As an avid Peter Pan fan, Peter Darling is my new canon and favorite of the retellings. SoC is a duology that is full of multiple types of diversity, sexuality included. At it’s core SoC is about a heist set in a fantasy world full of different types of magicks where being LGBT+ fits seamlessly. Two of the six main characters are queer, one bisexual and the other is gay. There are also secondary LGBT+ characters. Gentleman’s Guide is a historical fantasy with fantasy & sci-fi elements about a rake turned lovestruck youth in Victorian Europe on tour with his best friend and sister. GG’s protagonist, Monty, is bisexual, while his best friend and love interest Percy is not only POC, but gay. Monty’s sister Felicity is asexual and will be the heroine of the second book in the series, A Lady’s Guide to Petticoats and Piracy that comes out later this year. Mackenzi is also working on a highly anticipated LGBT+ series about Loki. The first book of the Sidekick Squad series, Not Your Sidekick is a superhero urban fantasy about teens gearing up for college. Add in super powers, or lack thereof for the main character Jessica Tran. Not Your Sidekick’s heroine is not only POC but LGBT+ as well, crushing on Abby, another superhero intern. Based on the novel-within-a-novel from her book Fangirl, Carry On is can be read as a standalone apart from it. The book itself follows two roommates in their final year at a magical school as they both fall for each other. With both gay and bisexual representation, Carry On is a fun book full of plenty of teenage tension. Carry On’s highly anticipated sequel, Wayward Son, was announced earlier this month. It’s due to come out sometime in 2020. Rick Riordan, a prolific writer of YA mythology retellings, recently won the Stonewall Award for Magnus Chase 2: The Hammer of Thor. The character Alex Fierro is a genderfluid demigod einherji, a hero who died heroically who becomes part of Odin’s eternal army. Magnus Chase isn’t the only series of Rick Riordan’s that features LGBT+ characters. The Trials of Apollo series features Apollo, also known as Lester, who is bisexual. Nico di Angelo and Will Solace, from his Percy Jackson series, make appearances in The Hidden Oracle. Both Nico and Will are gay and are in a relationship in the Trials of Apollo. It could be considered cheating that I lumped these two together to equal one, but look at it this way: I’m either terrible at math, or you get to add another LGBT+ book to your To Be Read list. A YA portal fantasy, In Other Lands is about Elliot, who is sent to a magical world where fighting is everything and he refuses to pick up a sword. It’s a coming of age standalone novel that goes through years within one book where multiple characters come to terms with their sexualities amidst magic and war. And I Darken is the first in a three book series of the same name, the third of which comes out July tenth. At its core, And I Darken is a reimagining of the tale of Vlad the Impaler, but if he was a girl. Lada and her brother, Radu, are captured in the Ottoman Empire amidst court intrigue and murder. Secretive and cunning, Radu eventually has to choose between his sister and the man he loves, Mehmed, the heir to the Ottoman empire. Though Radu’s feelings towards Mehmed are unrequited, the series interestingly handles Radu’s sexuality and how it was taboo at the time. There is also lesbian representation throughout the series. The Raven Cycle by Maggie Stiefvater is a four book series that follows a group of friends who are searching for a long dead king. Full of ley lines, tarot card readings, and traversing the Virginian countryside, TRC also has both bisexual and gay representation in the later books. There are two high fantasy series that I want to talk about that are a little older, less talked about, but not lacking in LGBT representation. It isn’t everyday you’re able to read entire, finished fantasy series with gay main characters who have complex plot lines and arcs that span more than a couple of books. Havemercy is a steampunk high fantasy series with two gay main characters. There just so happens to also be mechanical dragons. Havemercy turns ten years old this year and is the first of a completed four part series. The Nightrunner is a high fantasy series with thieves, magic, and intrigue. The first book in the seven part series, Luck in the Shadows, begins like most fantasy novels revolving around thieves and assassins, but once one character’s bisexuality is dropped casually into the mix the master and apprentice slowly turns into much more. 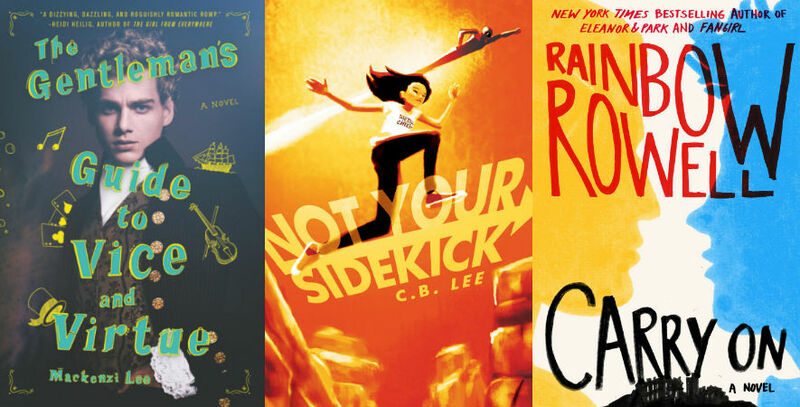 If you’re interested in non-fantasy LGBT+ YA as well check out this list of queer YA books coming out this year.